14 August 2017 - UPDATE. The fish table for the Trent pool has been reverted back to the Calpheon default and removing the Kamasylvia fish species, including the chance of the 'Message in a Bottle' item. Therefore, the only current way to obtain them is via harpooning. It is no longer possible to fish the bottle item, only via harpooning until Kamasylvia arrives. 16 August 2017 - UPDATE. Now confirmed as a low drop chance from the current Terrmian Waterpark open waters via fishing since the 16 August 2017 Patch Notes, which added a new fish table for the event. Set to run until the 30 August 2017 so for a limited time only. Now you can obtain "Bottle with a Note" by spearfishing. There is a chance of obtaining a treasure map upon opening a Bottle with a Note. Right-click the treasure map to receive a treasure hunting quest. Based on the quest content, figure out the location of the treasure and dig it up. Hand over the treasure to Marzana in Ibellab Oasis to receive Sealed Golden Treasure Chest as a reward. Use a Gold Key to open the Sealed Golden Treasure Chest. As the notes stated, the item can be obtained while harpoon fishing. It leads onto various versions of the Gardaka’s Treasure Map which starts an associated quest depending on which version you get. The quest is to solve the enigmatic riddle included in the map tooltip text. However, while exploring potential Kamasylvia fish species along the border of thar region due to beww opened here sometime in March, I found a small pool which contains a Kamasylvia fish table (including the Swiri), to my surprise I fished up one of the bottle items. So I can confirm that it is possible to also fish up the Bottle with a Note item as well as via harpooning now in-game. The bottle functioned as expected and started the quest. Thinking it may be a bug I continued to fish and a day or so later fished up another which confirms that it is possible now in-game in our region to obtain it via fishing and not just by harpooning. Checking further, I have now found two other references to these being fished up in Kamasylvia from the Korean forums so it looks very much like this is a deliberate design decision to add it as a rare drop probably in any Kamasylvia water body. 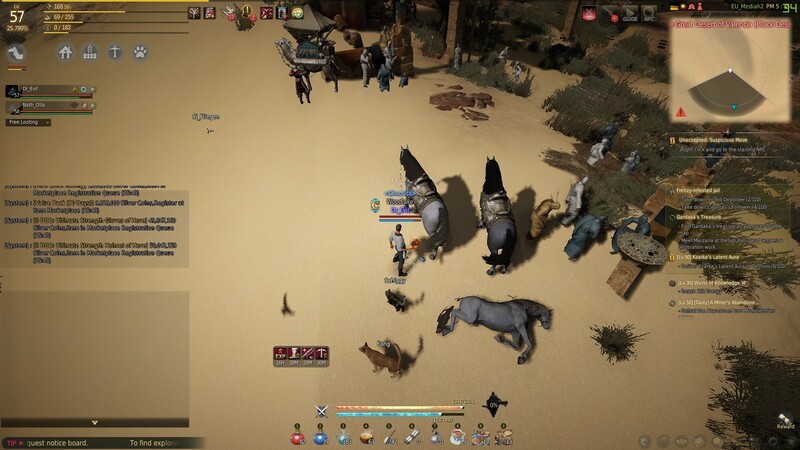 The reason we can catch them before the new region is opened is because the fish table overlaps a bit into existing land in Calpheon. This happens occasionally, like for Margoria before launch etc. The only water body I could find with another fish table other than that already posted on, accessed over the border into Kamasylvia from the Ross Sea, was this small pool found to the SW of Trent. It is in the Cyclops Land area (on the mini-map) and why I refer to it as the Cyclops pool. The location is indicated on the attached image being above the Ksarka Shrine (Calpheon). The pool can be accessed by moving SW out of Trent from the storage keeper, up the hill and then either side of the shrine entrance steps. Or up those steps past the shrine NPCs and jumping off and climbing the rocks to reach the pool set back a little from actual shrine entrance. Players should be aware that although fishing gives probably a more realistic option for obtaining a bottle item over harpoon fishing (the drop rate may vary etc. 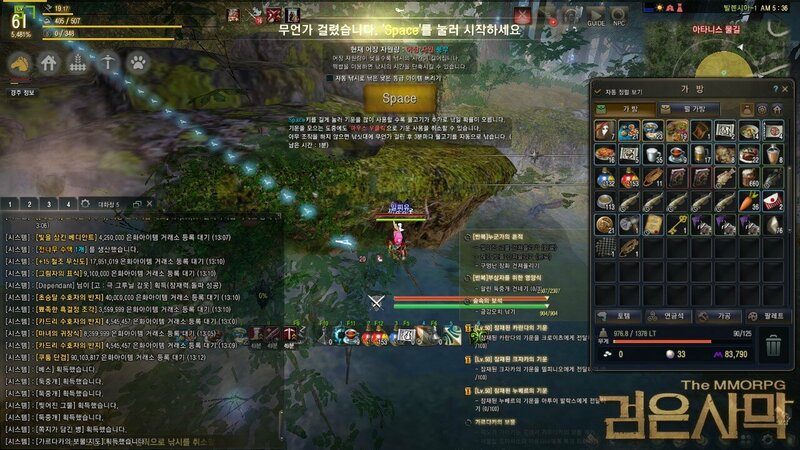 ), I have yet to see even on the Korean forums any actual confirmation of one of the actual treasures being located by solving the various riddles. In time I expect the locations will become common knowledge and having something hard to solve is really cool in itself, currently it will require a lot of communal detective work to try and work out the locations and gain the Golden Chest reward. I can also confirm that only one quest can be accepted at a time and the bottles and treasure maps are bound items, so until the current quest is completed you wont be able to remove the item from inventory or it will be forfeit as the item tooltips state. For more detail on the Swiri found here also and fishing table generally please check out the separate thread here. Good luck with fishing one up (or harpooning) and join the world hunt for these treasure locations. Is there a thread to find the Location of the Chests obtained by the Note? I got no clue where to find that. Gardarka Bandits terrorized all of Valencia in times of yore. King Imur Nesser decides to wipe out the bandits to put an end to their infamy and the losses of the traders. Marbie, the last commander of Gardarka, lost all of his bouts with the immaculately trained Valencia elite forces of King Imur. Marbie and his men were driven from Ibellab Oasis to Gavinya Cliff. It is said that, before Marbie fought his last battle with Imur, he wrote down all the clues pointing toward the multitudinous treasures of the bandits. and strew the pieces of paper, their numbers large, from a cliff. They are hidden here and there in the vast desert, ingeniously camouflaged by the Ancients. so your point could be where they driven of the cliff? This is like legitimately super intriguing love it. So the messages in the bottles vary and if you work out the clue you get a gold chest from the quest? Sounds absolutely awesome! maybe any of you knows some korean? "Damn natives chasing me third day in desert. My horse died yesterday, every step is harder and harder. I tried to ask for protection in Pilgrim's Sanctum: Sincerity, but they are afraid of the natives. I must bury everything valuable here and pick it up later. I'll try to ask for help in Pilgrim's Sanctum: Sharing." With what I have in my bag, I will rule the world! Silly natives were not even aware of what a value! The main thing to break away from the chase ... The sanctuary of modesty gave me a good horse, but she was already exhausted. Bury the goods here , under a tree. I hope I will be able to hide in Tituma valley. is that the exhausted horse? its south of pilgrim sanctum humility... but shouldn't it be a skeleton by now? is there a certain fishing level required to obtain these bottles? How much did you fish for a bottle? I'm at ~24 hours pure fishing master 19 balenos rod +8 branded, 192 slots, filled them all 3 times, no drop. Not to be "that person" but... Did you forget to link to the swiri thread? Thanks for that. The forum editor is a nightmare and decides to not let you add links sometimes and forgot to do it after ;). Done now. I got two in 3-4 passive session with similar stats. It's going to be RNG but seems it's not ultra rare from that and those already posting on fishing them up. It will come but RNG as ever in this game. When we have more data fro catches it should give a clearer drop rate. GL. It's going to be tough. Not even a confirmation post on KR I have found yet and they have had it for weeks already. Once players do find it then it will just be a matter of checking location and loot. I suspect the Russian versions are deliberately seemingly more specific and possibly to make them easier. But then it's meant to be a vague clue and for the player/s to work it out. Just some challenge in the game for now which is fine with me. All adds to the fun As is reading the Google translations looking for scraps of info They will get posted sometime and more are looking now becuase of this so hopefully some confirmation exactly how to get them and location soon. Wow crazy you got fish out of that hole, last time I was up around there it was 0 fish and all trash. Fish Array looks just like as posted so far, nice info thanks. Just fished this up after 1 hour of afk fishing just trying the spot out. No idea what this does, but heres the note that I got. oh. So I got a dud? http://bddatabase.net/us/item/43801/ here you can see what the bottle can contain. "Where it is full of Aal's grace, a snake slipped into Old Moon's embrace. Infuriated, I fed the vile snake with a sweet blade." "The natives are not far behind! Probably not worth stealing in their shrine. Damn, how sore feet... Where am I? Pilgrim's Haven? I'll bury everything here, and come back later. We need to somehow get away from the chase..."
yeah thats the thing.. but the korean, french , japanese, german translation is 1:1 the english translation.. only the russian is different. So maybe if some of you guys knows russian you may could ask a russian streamer if he knows more about that or even check the russian forums.